There are four type of Views in Targetprocess: Board view, Detailed view, List View, and Timeline view. List view allows seeing entity details in a well structured and aligned table. 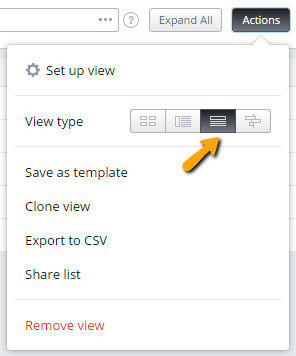 To create new List view click + Create → List in the bottom of the left menu. To switch any existing view to list mode, click the List icon on the Actions menu → View type selector. There are several cases when lists might be especially beneficial. You would like to see more properties for an entity than can be reflected on a card. In list view each entity is represented in a single row, so you have more space to place additional properties. You need to see the hierarchy of your data. It is possible to use up to 3 levels of hierarchy: two levels are defined in view settings (parameters for rows and columns), and the third one are the entities selected as cards. As a result you can build a view to see the hierarchy of your project. I.e Project → Feature → User Story+Bugs. You need to review a particular property across all cards. Since list view looks like a table, all data are well structured. It means that if you would like to check which release every particular user story is assigned to, you need to review only one column rather than looking for this information on each card. When you configure a list, you use the same principle as in the board view setup. On the Setup tab you can select cards, first and second hierarchical levels above them, and apply filters to cards and lanes. Entities selected as cards are shown on the third hierarchical level. Here is a brief example. Let’s visualize the functional hierarchy of projects: Project → Feature → User Story. User Story is on the third hierarchical level, and thus we selected it as cards. Missing Entities?! Check your filters. Sometimes even entities created in a view will disappear due to filtering. Context, view filters, and lane filters determine which data set appears in a given view. A view is just an expression of selected data, make sure your choices reflect what you want to see. Some hierarchical list views add fourth sub-level which is nested to cards level automatically. For example, Tasks and Bugs are shown under User Stories. The sub-level cannot be customized or filtered so far. Similarly to cards on Board view, information displayed in Lists is customizable. Cards level from List view can be exported to CSV file. Use Actions → Export to CSV menu item for this purpose. This widget allows you to add any List View into a dashboard. Up to top 30 items per each embedded list are shown in the widget. It is hard to enumerate all potential cases for this widget usage. You can create Lists that show latest requests, people load, active user stories, important bugs, etc. You can have as many custom Lists on a single dashboard as you wish.